What could possibly be more fun than they iconic, fun-to-drive, Volkswagen Beetle? The comfort of modern technology in an old soul, the 2018 Volkswagen Beetle has been a favorite for decades. With years of engineering behind every inch, this iconic vehicle is guaranteed to have something for everyone. The 2018 Volkswagen Beetle has many great power and performance features, such as the engine that it comes fitted with. The new Beetle has a 2.0L TSI® in-line 4-cylinder turbocharged engine, which delivers all the power it could need. It has an output of 174 horsepower and 184 lb-ft of torque, this engine is complemented by a 6-speed automatic transmission and several driver modes. The 2018 Volkswagen Beetle has many great interior comforts, such as 6-way manual adjustable front seats with heated seating available. The seats of the Volkswagen Beetle have many materials available, such as a Pepita cloth and V-Tex leatherette. The 2018 Volkswagen Beetle also has many premium infotainment features, such as the Fender Premium Audio System. This system will give you clear, concert-quality sound, especially when paired with the many other infotainment features. There are many great available technology features, such as a rear-view camera system and a Volkswagen Car-Net® App-Connect. The Volkswagen Car-Net® App-Connect allows you to connect your compatible smartphone to the vehicle and access compatible apps on your touchscreen display. 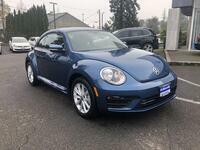 The 2018 Volkswagen Beetle is an old soul with all the comforts of modern technology. Iconic, fun-to-drive, and packed with great features. Experience it for yourself, contact us at Volkswagen McMinnville for a test drive today!